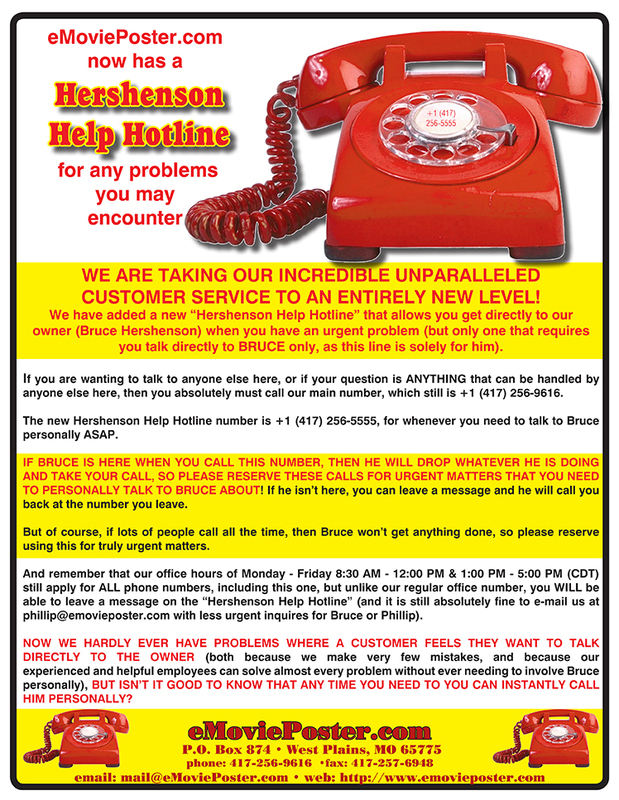 Wanting to add books to your auction order? Know that if we can add it to your package without raising the cost of shipping, then we will do so with no added shipping charge, but if it raises the cost then you will need to pay the difference. 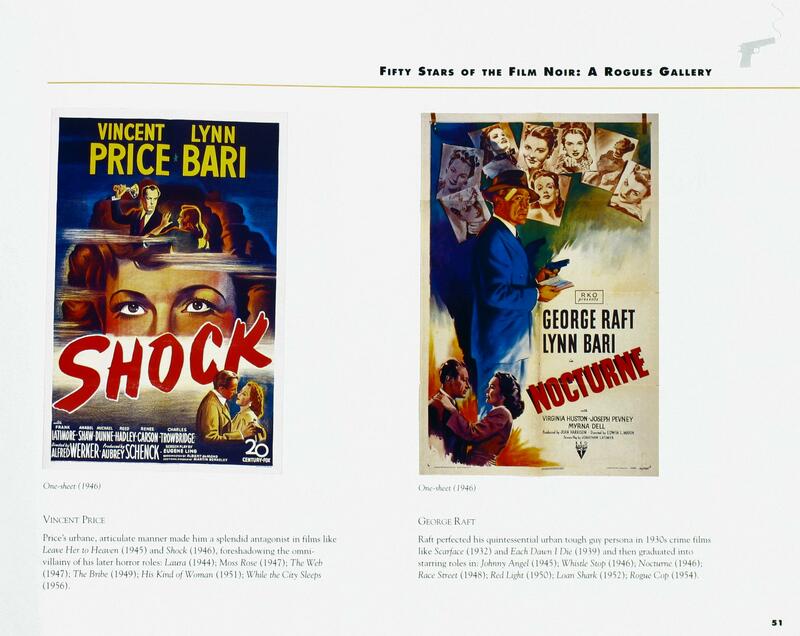 Legendary collector of movie Judaica, Ken Sutak, has assembled a portion of his amazing collection into an about-to-be published book, titled "Cinema Judaica: The War Years, 1939-1949" (ISBN-13: 978-1-884300-25-7), which takes a unique look at how Jewish-themed movies prepared Americans for war with Nazi Germany, rallied the Allies to victory, fought anti-Semitism, portrayed the Holocaust in Europe, and captured the refugee exodus to Israel. This great book features 200 rare movie posters, publicity stills, and other images in full-color spread over 228 pages. What is unusual and really great about this book is that it is FILLED with text, detailing a huge amount of information, both about the movies and how the U.S. reacted (and in some cases, did not react) to the events occurring in Germany before and during World War II. I give this book my highest recommendation (which is why I am distributing it, because everyone should read it)! NOTE: The book is available in a Kindle version from Amazon.com for $9.99, and we at eMoviePoster.com are the exclusive online distributors of the softcover print edition (it is also sold at museums). We are taking orders for the cover price of $20, plus shipping, and they are ready for immediate shipment. Click HERE to see examples of images from the book! Incredible! You can get FOUR of the very best Universal Masterprints (Dracula - cartoon style, The Wolf Man, The Mummy, and The Invisible Man) in this incredible set! Learn More about the Universal Masterprints or order by clicking the "Add to Cart" button! Incredible! You can get TEN of the very best Universal Masterprints (Dracula - cartoon style, The Wolf Man, The Mummy, The Invisible Man - regular, The Invisible Man - teaser, Creature From the Black Lagoon, The Black Cat, Frankenstein, The Bride of Frankenstein, and The Raven) in this incredible set! Learn More about the Universal Masterprints or order by clicking the "Add to Cart" button! Incredible! You can get SIX of the very best Universal Masterprints (Dracula - cartoon style, The Wolf Man, The Mummy, The Invisible Man - regular, The Invisible Man - teaser, and Creature From the Black Lagoon) in this incredible set! Learn More about the Universal Masterprints or order by clicking the "Add to Cart" button! This 1st edition of Crime Scenes: Movie Poster Art of the Film Noir (The Classic Period: 1941-1959) is a deluxe 159 page oversized full-color softbound book published by Lawrence Bassoff featuring 171 movie poster, lobby card, and pressbook images from 100 film noirs (including the absolute best titles). The book includes a foreword by director Robert Wise, lots of great historical details about each film including chapters about movie poster terminology, a section called "How do you know it's a film noir? 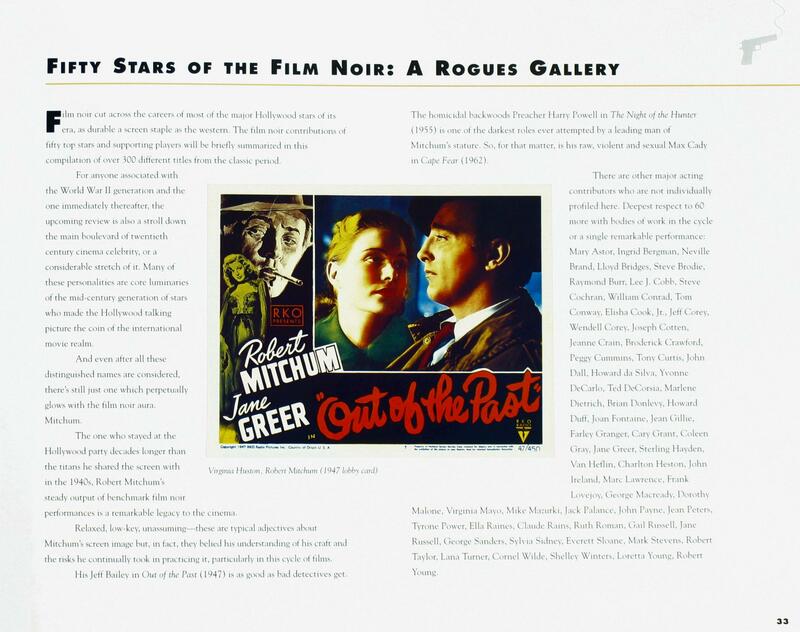 ", a section about the stars of film noir, and much more. 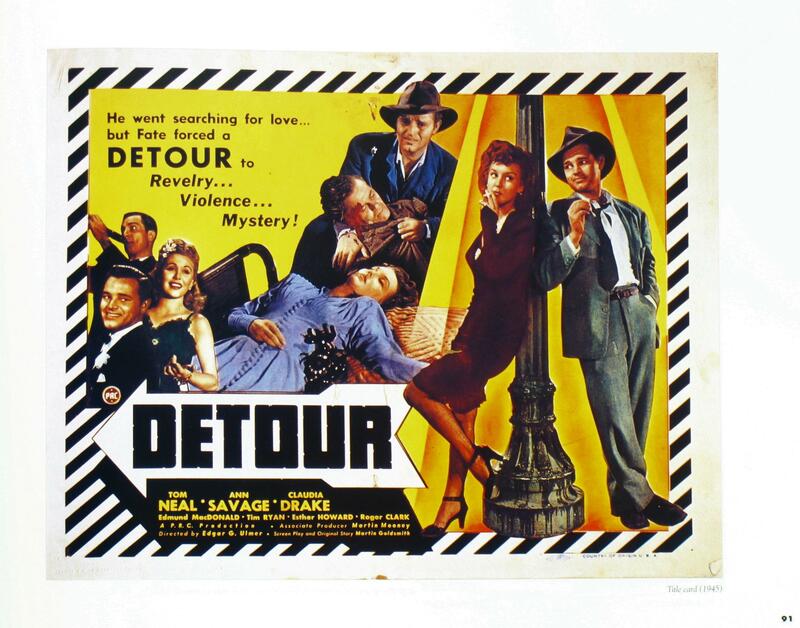 This book is both for any film noir fan and is also a must-have for all movie paper collectors! The book was published at $35, but we are offering our remaining copies for just $14.95, 60% off the cover price! 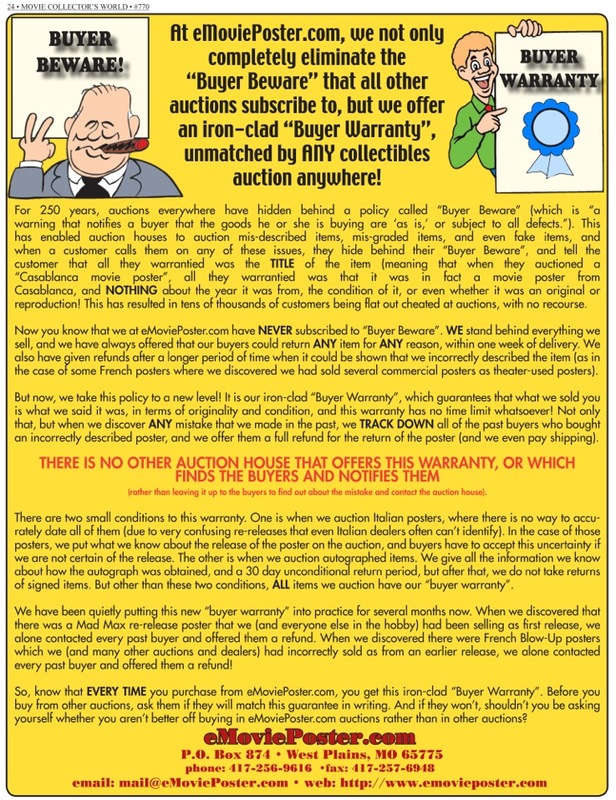 You can get ALL SIX $10 publications (with a total of 150,000 verified prices from 2000 to 2008!) for just $15.00 and you get all six volumes (with virtually no duplication)! So that's an incredible $45.00 savings for all six! 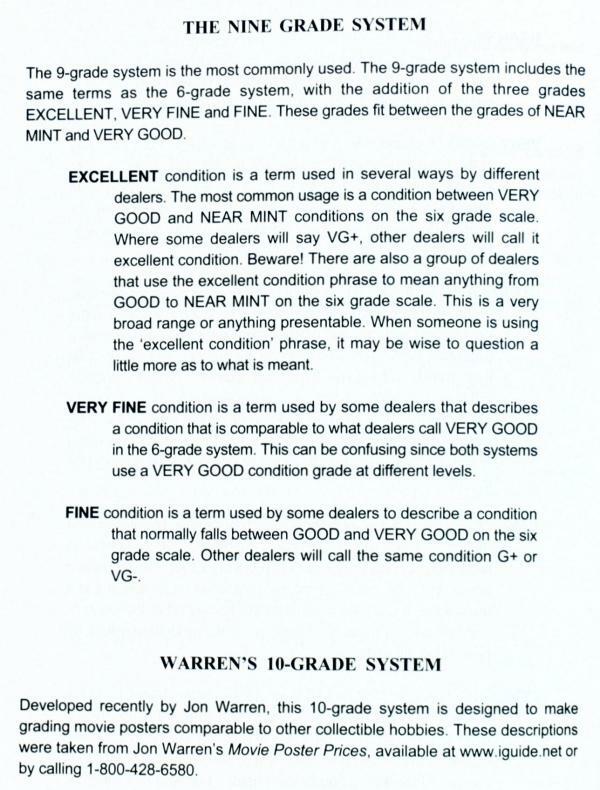 Remember that, unlike price guides, these solely contain verified Sales Results (100% accurate, with no canceled or re-negotiated sales), so the old editions remain quite valuable as reference guides. MAJOR CHANGE IN THE CONTENTS OF THE 2009 EDITION! Many people have told us that they would prefer to have more than one year's sales data in a single edition, but that they don't want to have data going back 20 years (and we can't blame them, because how much value is a result from 1990 or 1991?). 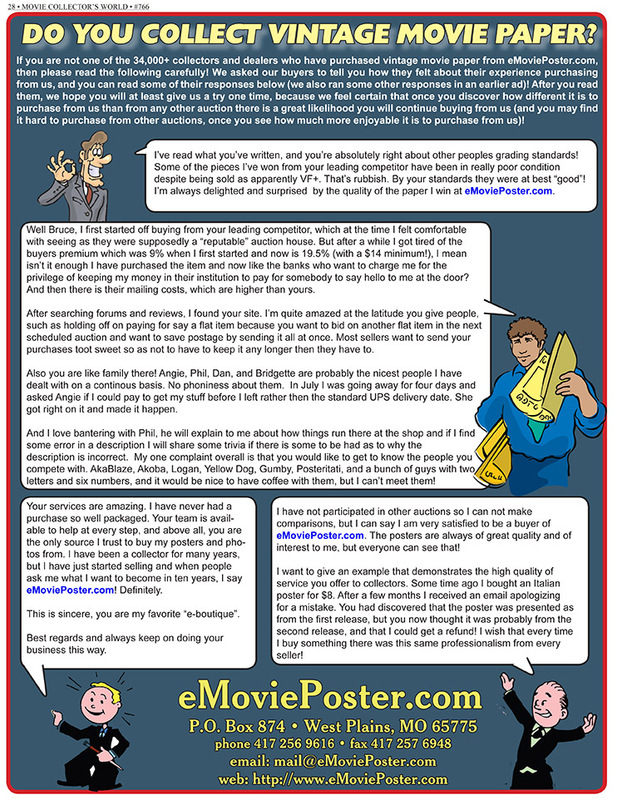 We know that the movie poster hobby underwent a massive change in 2000 when we began auctioning on the Internet, and so this new 2009 edition is called "The Internet Era" and contains ALL of the results from our Internet sales from 2000 to 2008, all in a single volume! But since we only had room for items that sold for over $141 (due to space limitations), you still will want to have our earlier editions, because those include many items that sold for between $20 and $141. Regular Retail Price $60 Special Website Price $15! Written by Susan Pack. Printed in 1995. 319 full-color pages. 1st edition hardcover (with the dust jacket) printed by Taschen. All of the text in this book (and there is a huge amount!) is printed in three languages: English, German, and French. Included is a foreword by Christopher W. Mount (the curator at The Museum of Modern Art in New York City). 16 pages about the history of Russian film posters, an index, "Artists' Biographies" providing brief biographies of several Russian artists, and 250 images w/ description! This is a first edition copy of this book, and it is in mint, unused condition (the copy is shrink-wrapped, just as it came from the publisher)! The book was printed in 1995. The original cover price of this book is $40; but while supplies last, you can buy it for just $24.99! This is a newly published complete 220+ page, exact facsimile edition of the very first publication of "Tarzan of the Apes" from 1912. Before there was a book version, "Tarzan of the Apes" appeared complete in a single issue of "The All-Story", a popular pulp magazine of its day, in October of 1912. It wasn't for two more years that the first book edition was published by A.C. McClurg. This is an exact recreation of the original pulp magazine, including the full-color cover, which is the very first image of Tarzan ever drawn! The only difference between this facsimile and the original pulp magazine is that there is a small barcode on the back cover, and the covers and interior are printed on a high quality paper, unlike the pulp which was printed on cheap pulp paper. There are only a handful of copies of the original pulp in existence. One recently sold for $25,000! This facsimile edition is only $14.99! It was published in 2000 at that price, and it has a great chance of quickly selling out and becoming a collector's item in its own right! Written by Steve Schapiro & David Chierichetti, this first edition softcover book published by Dutton was printed in 1979 and contains 95 full-color pages. 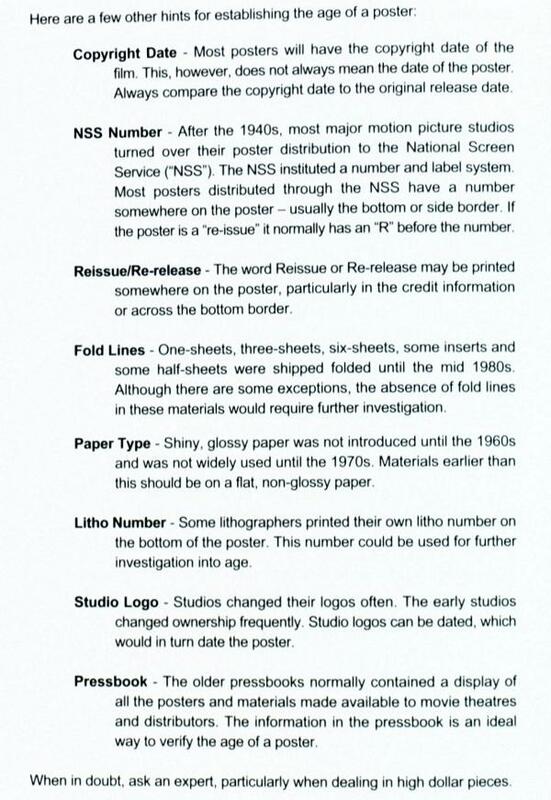 The first 13 pages provide a brief history movie posters. The remaining pages contain full-color images of 119 movie posters (many of which garner a full-page image) with a brief explanation of most of the images! The book has been out of print for over 15 years & has sold for up to $50 in the collector's market! What It Is... What It Was! This book contains lots of full-color movie poster and advertising images from the best black African American films of the 1960s on (sometimes referred to as "blaxploitation" movies). 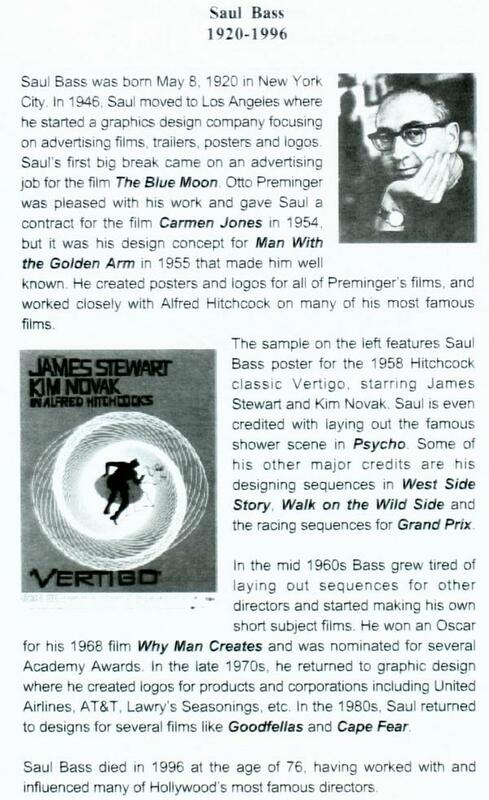 It includes articles written by those who made it happen and those who were influenced and inspired by these films including artists like John Solie and directors like Melvin Van Peebles, Roger Corman, John Singleton, and Quentin Tarantino, and stars like Pam Grier, William Marshall, Roscoe Orman, Fred Williamson, Kevin Hooks, Robert Townsend, Rudy Ray Moore, Isaac Hayes, Ice-T, and Samuel L. Jackson. Most of the poster images come from the amazing collection of Ron Finley. This book is a must-have for fans of blaxploitation, 1970s cinema, and also movie paper collectors! This book is completely sold out at the publisher, and we have a very short supply of these, and when they're gone, they're gone forever! 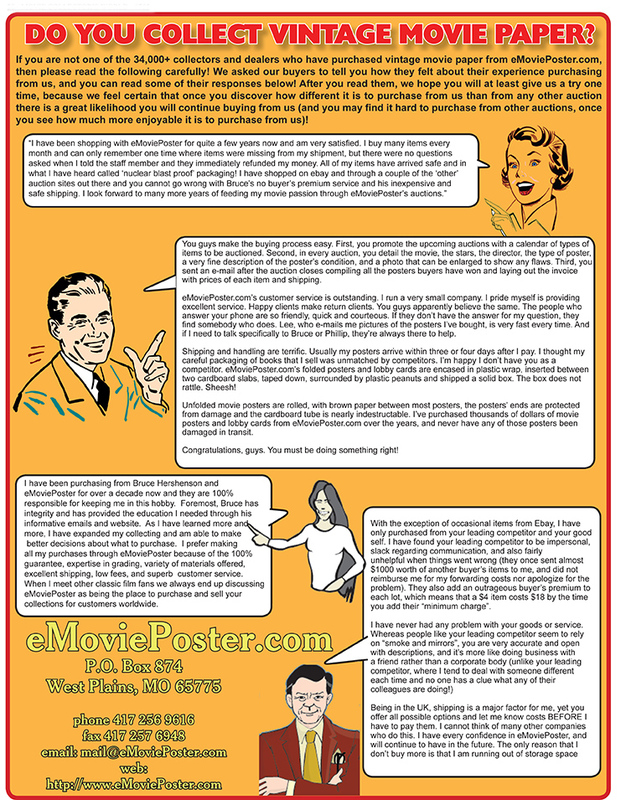 Learn About Movie Posters by Ed and Susan Poole answers the important questions collectors need to know about this fascinating hobby. 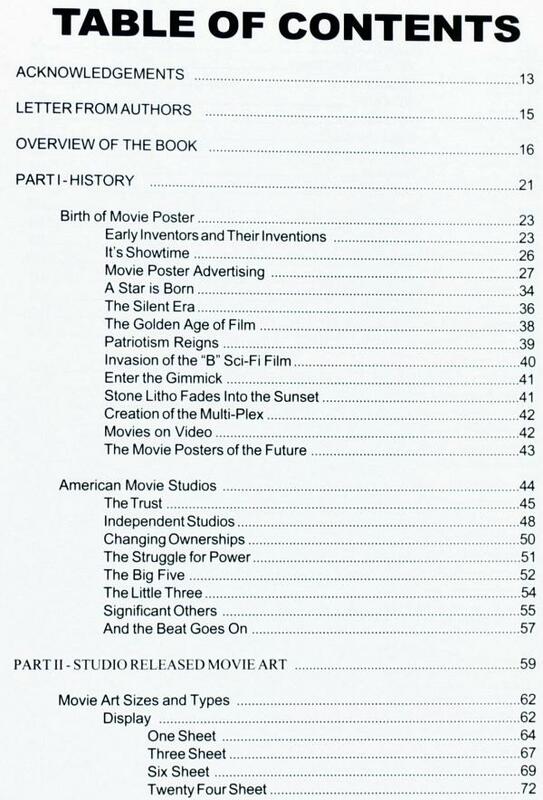 It's the most comprehensive book ever compiled on original movie posters and how to collect them. In over 400 pages, you will learn about: the birth of the movie poster, the sizes and types of movie art, common forms of movie art, how movie posters were processed and distributed, the different types of international movie posters, movie art as investments, assessing the condition of your movie art, how to buy and sell movie posters, the poster artists - who they were and which posters they created -, caring for your collection, and much, much more. 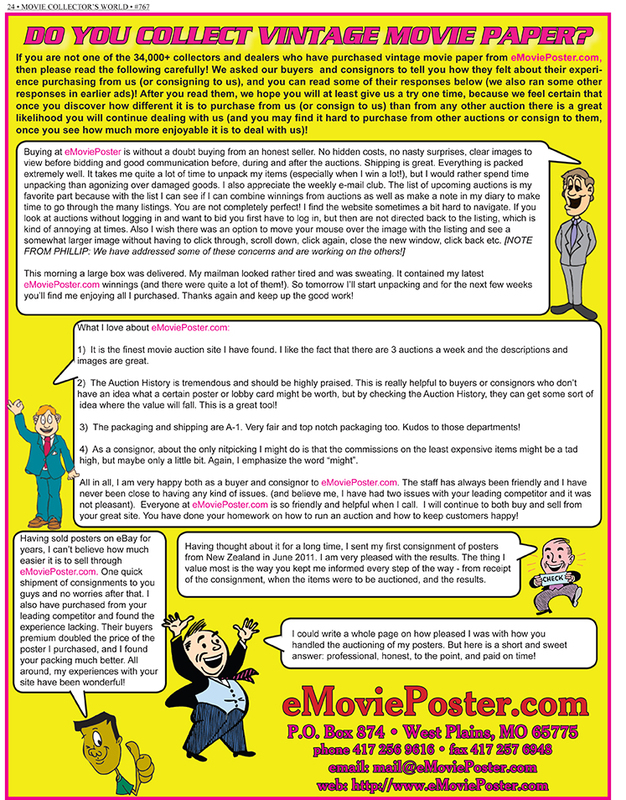 Ed and Susan Poole's Learn About Movie Posters is the first book that teaches you everything you ever wanted to know about collecting authentic movie posters. The book was published at $29.95, but we are offering our remaining copies for just $5.99, 80% off the cover price! 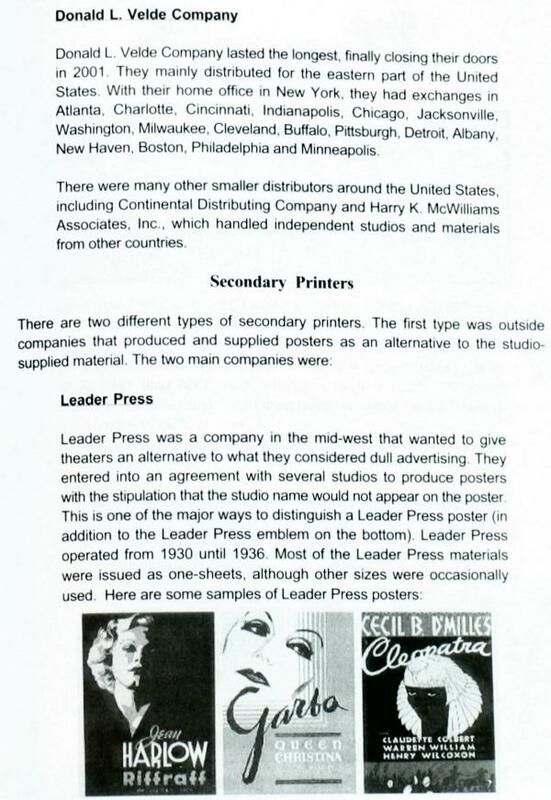 You can view sample pages from the book at the following links: Table of Contents page 1, Secondary Printers, Saul Bass artist page, Condition Grading, and Establishing a poster's age. This great full-color magazine is entirely devoted to the great legendary poster artist, Bob Peak! This magazine has lots of full-color images of original artwork (without the credits and titles which were added afterwards), all shot directly from Peak's originals (including some that do not appear on movie posters), and has a great in-depth overview of Peak's entire career written by his son! This issue is completely sold out at the publisher, and we have a very short supply of these, and when they're gone, they're gone forever! This great full-color magazine contains lots of great illustration artwork! This magazine has a long article that is of special interest to movie paper collectors on master horror/sci-fi illustrator Reynold Brown, with many full-color images shot directly from his originals (without the credits and titles which were added afterwards)! It also has fascinating articles about Revell model kits and "The Art of Frank E. Schoonover". This issue is completely sold out at the publisher, and we have a very short supply of these, and when they're gone, they're gone forever!